Belfast is a fair way from London – in so many senses – and today it feels further away than ever as Westminster schemes on Brexit whilst complaining bitterly about including a backstop to avoid the catastrophe of a hard border on the island of Ireland. It is practical rather than political distance keeping me and others from Saturday’s Put It To The People March, though. Like very many in Northern Ireland, I fully support a People’s Vote as the best way to resolve the Brexit crisis, and know young voices from here will address the crowds. For that reason, I appeal to all friends and comrades in Labour to make the effort of being there. For Ireland as well as for Britain, there is no good Brexit and no Brexit deal on the table that avoids new barriers either on the island or down the Irish Sea. The social and political effects of the referendum are already profound – sharpening all the lines that the Good Friday Agreement was designed to soften. I don’t pretend that Labour’s record on Ireland has been perfect. Even in the Tony Blair and Gordon Brown years – where there was no doubt about the government’s commitment to securing peace and progress in Ireland – there was also a fundamentally flawed approach of appeasement of Sinn Féin and the DUP, which normalised rejectionist and intransigent politics rather than fostered the co-operation needed to make the institutions created on Good Friday work. But there has never been any doubt – before now – that a Labour government is by far a better outcome for all of us in Ireland than any other administration. I say before now because in recent months that outlook has been tested at times. Too often it has looked like Labour wanted Brexit – any sort of Brexit – to happen, particularly if it made things worse for the Tories. We have even seen the Labour leadership coalesce with the DUP in opposing the backstop. Thankfully, on the latter point at least, sensible voices prevailed, and Labour has accepted that if Brexit is going to happen it needs to be with an insurance policy against customs posts, security checks and the other paraphernalia we all hoped we’d left behind. We hope to be able to trust again in Labour’s commitment to Ireland North and South. 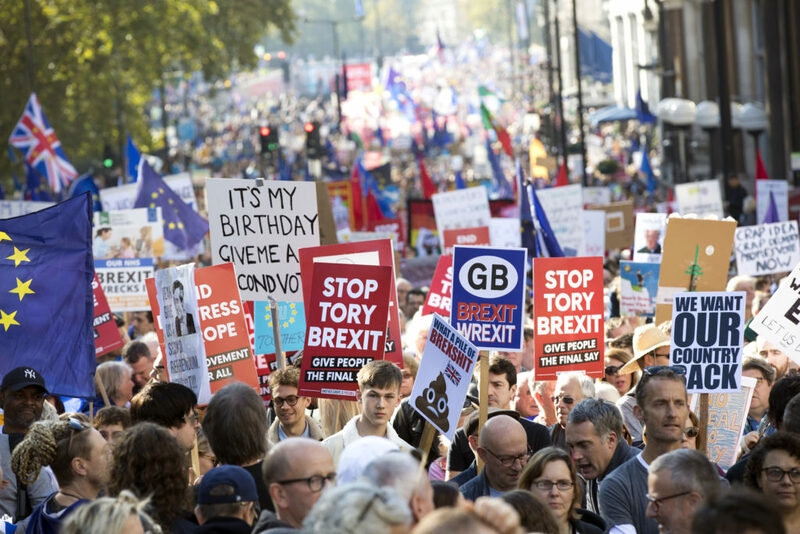 That is why I hope tomorrow I will be looking at pictures and footage not just of people with blue and yellow European flags but also the red of the banners of the Labour movement marching to Parliament Square. This promises to be one of the biggest protest marches in a generation and with a desperate government on the ropes, willing to take risks with peace in Ireland and the economy of these islands, it must be right for Labour to be leading the only serious alternative. Claire Hanna is MLA for South Belfast.